This vintage real photo postcard features five adorable uniformed boy and girl scouts sitting in a row on an unidentified beach. These children are enjoying life. Nothing like the innocence of youth. These kids offer good examples of “wind-swept hair”. This real photo postcard portrait is in very good condition (see scans). 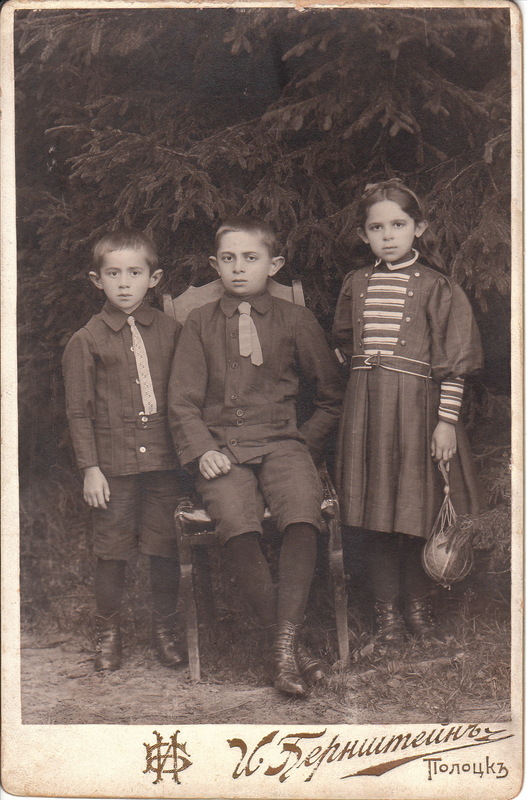 This cabinet card features three children, likely siblings, posing for their portrait at a photographic gallery in Polotsk, Belarus. The young girl in the photograph is holding a ball held inside netting. Perhaps a visitor to the cabinet card gallery can provide more details about this toy. The previous owner of this cabinet card is from St. Petersburg, Russia. He has provided the photographers location, as well as the photographers name, Bernstein. He also contends that the way that the subjects are dressed in this image, indicates that they are scouts. In addition, the previous owner also asserts that the photographer of this image was Jewish. In fact, research reveals that the population of Polotsk in 1897 was over 20,000, and more than half of those residents were Jewish. There was a strong Orthodox Jewish community there. The “Jewish Virtual Library” indicates that in the late nineteenth century, the city became embroiled in anti-Jewish agitation.